She urges everyone on, and in response all present go wild with excitement. This is a glimpse of how Ambuya Jenny Muchumi got participants involved in a ceremony, with her explosive energy and drive. Use the links and listen to samples of her albums. Jenny Muchumi was born on 9 June 1950 during the kurova guva (ceremony to bring a new ancestral spirit back to the community) season. Njuma Kraal in Seke Communal Area celebrated when Tangwara Chingwaru and Esnath Mandizvidza welcomed their first child into a family that would grow to two boys and five girls of the VaSeke clan. Jenny grew up at Njuma Kraal under the watchful eye of her grandmother Ambuya Hurugumi, who was the medium of a mhepo spirit called Chingumira. Jenny lived with her grandmother because her parents worked as farm laborers in the Dewedzo area of Rusape, and it was not a good place for a young child. Also, as the first child, and first grandchild, she was the pride and joy of her parents and grandmother. Ambuya Harugumi had a banya (ceremonial hut) called Zvakapindwa, which she used for rituals and for holding court with other great spirits. It is in this banya, and at her grandmother’s home, that Jenny learned about traditional music. Music was a key component to the activities that went on in the banya and in the healing sessions that took place at home. It was the late Canaan Jirira, a cousin who played for her grandmother, who taught Jenny her first mbira songs. She was taught the kushaura (lead) parts of the traditional mbira repertoire. In 1964, Jenny was good enough to play for her grandmother in the banya, as well as when her grandmother healed people. Ambuya Harugumi noted that Jenny was the first woman in the clan to play mbira, and she instructed Canaan Jira and Elias Mhizha (her aunt’s son) to teach Jenny as much as they could. The teaching method was that Canaan and Elias would play mbira, and Jenny would observe their hand movements and the keys they hit. She would then replicate the same keys on a different instrument. Jenny Muchumi attended school up to Standard Five, which is the equivalent of five or six years of primary education. It was expensive, and neither her parents nor her grandmother could afford to keep sending her to school. Jenny was bitter that the tateguru (ancient spirit) she had was angry, and that people were disrespecting its wishes. She tried to appease her spirit, but it was not enough without the cooperation of the men in the family. Jenny was worried that, in the patriarchal Shona society, the spirit would never be allowed to come through her, because the men were adamant about not empowering her in such a manner. When Jenny helped her ambuya (grandmother) in the banya, she was not compensated in any way. She played so that her grandmother would work with svikiros (spirit mediums) and midzimu (spirits) who came to Njuma Kraal. Canaan Jirira usually played the kutsinhira (intertwining part) and Jenny played the kushaura (lead part). When asked where the dance steps come from, Jenny simply said she started dancing at her grandmother’s banya at ceremonies, and she does not know how the actual movements started. Ambuya (“Grandmother”) Jenny Muchumi was very good at kukuza mbira (encouraging musicians and participants in the ceremony). 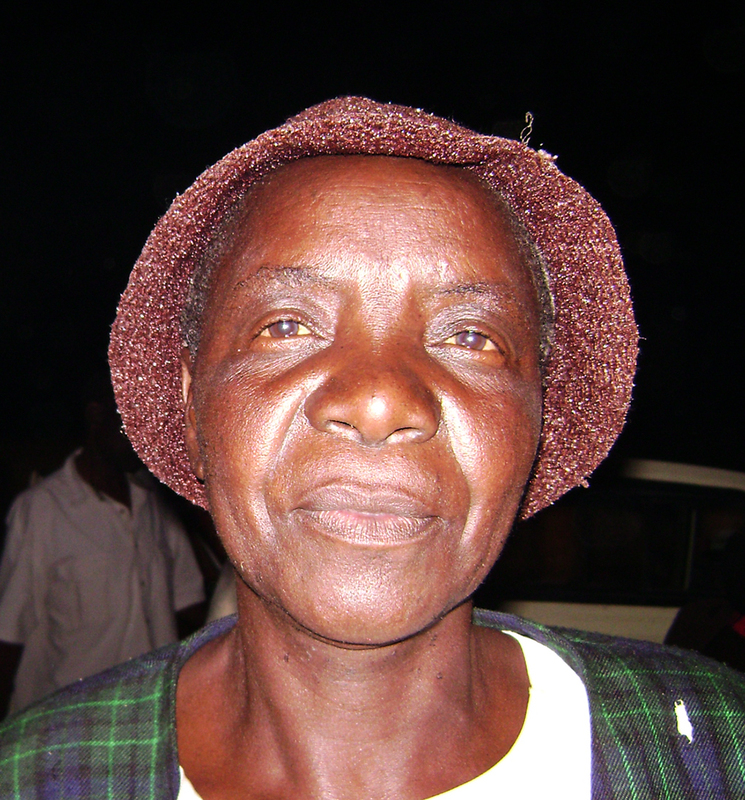 She used the words “Mbira”, “Hosho” (rattles), “Manja” (clap) and “Ngoma” (drums) to encourage people. When she called these out, the mbira players were reenergized, the hosho players increased their tempo, the handclappers increased the volume and the crispness of their clapping, and the ngoma player rolled his mutumba (type of drum). The resulting effect was the true experience of a traditional mbira ceremony in Zimbabwe. In this respect, Muchumi was echoing the sentiments of many mbira players who prefer the old ways of doing things. As much as the music is dynamic, all mbira players acknowledge that the old songs are powerful. Born Jane Chingodza, Jenny married Musekiwa Muchumi in 1967; together they had seven children, two girls and five boys. Musekiwa was a n’anga (traditional healer), and Jenny’s mbira playing was helpful to his practice. She helped him with his practice in the Mufakose area of Harare. When he retired from work, they moved with the family to what was then Mhondoro Tribal Trust Lands. Jenny continued to play mbira in Mhondoro, and she had the advantage of being a female mbira player. Starting in the early 1990s, Jenny’s husband suffered from mental illness, thought to be a result of a family vendetta. Her husband’s relatives did deal with the problem, but it persisted. With her husband incapacitated, Jenny turned to both music and subsistence farming to support her family. As the main breadwinner for the family, the proceeds from her MBIRA recordings, and from her performances, helped to support her and her family. Jenny teamed up at various times with the late young Simon Hoto, Crispen Mashayamombe, Alois Mutinhiri, Rodwell Muturikwa and Friday Chamunorwa over the years she lived in Mhondoro. Her most consistent partner was Simon Hoto, who taught her more kushaura (starting part) variations to various songs, and his singing added variety to Jenny’s huge repertoire of singing styles. Jenny and Simon’s performances were always packed because they had an undeniable attachment with the music, and the fact that they worked together for a long time rendered their music polished and powerful. The proceeds from their performances were shared equally despite the fact that she was the leader of the group. When Simon Hoto died, Jenny stopped playing mbira much for a while. She eventually started playing again, teaming up with Simon’s friends Mudavanhu Magaya and Denver Banda, and Mudavanhu’s father, Cosmas Magaya. Jenny’s vocals, mbira and dance made her a key member of their group, Mhuri yekwaMagaya, for 11 years. She performed at important functions, including the installation of Chief Mashayamombe. To pass the knowledge on, Jenny taught her grandson Alan Chashaya, and son Stanley, to play mbira. Jenny Muchumi taught and performed with Vakaranga Venharetare, including Patience Chaitezvi Munjeri and Erica Azim, during her 2008 US tour organized by MBIRA. Since her passing in 2011, Ambuya Jenny Muchumi is greatly missed by her family, community, and friends around the world.